Deschutes Bachelor ESB is a spectacular beer. Served almost exclusively in the brewery’s pubs and tasting room, this session Bitter is a local’s favorite (this local has logged more time with this beer than any other). I have tried several times to clone this beer but never hit the mark. I mostly attribute this to not enough time to get rid of each iteration’s beer, combined with a general tendency to get distracted on other things life throws my way. 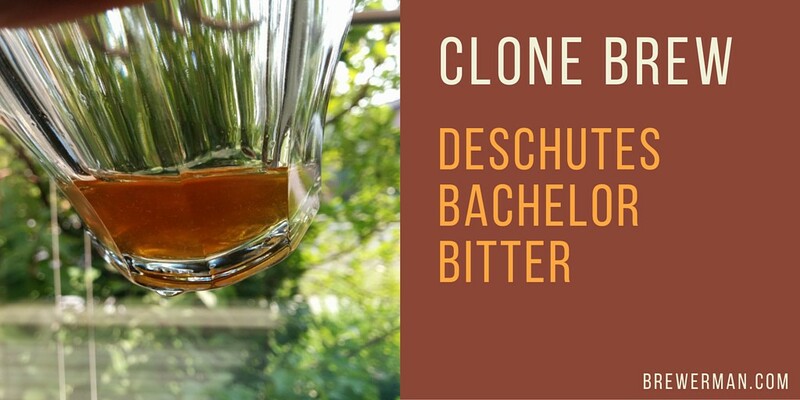 With smaller batch volumes, however, I can brew, bottle, drink, and make adjustments for each attempt producing the target profile I am after, so I have reset my sights on fine-tuning a version of this beer that I can add to my list of frequently brewed recipes. Bachelor ESB is an american expression of a classic English Bitter, not far removed from its source of inspiration. This Bitter is medium bodied, 5% ABV, and is mildly bittered with american hops grown her in the pacific northwest. It is my ideal session ale. What follows is the first round of brewing, plus take-aways. I will updating this post with a link to the post detailing the round of brewing once that is finished.